I’m extremely pleased to report that StockCharts.com — the best platform for free financial graphing with additional expert and pro levels — has invited me to write a twice-weekly column. It appears most Tuesday and Thursday mornings in the free section of the site, which is open to everyone. See Newsletter #12. Receive our FREE monthly newsletter. 1. Your email address will never be sold, rented, or given away to any outside party, ever. 2. You will never receive any emails other than Muscular Portfolios updates. 3. Unsubscribe requests are honored immediately, period. "I know of no book for a general in­vest­ment audi­ence that is more thor­ough­ly re­searched and backed up by hard data." 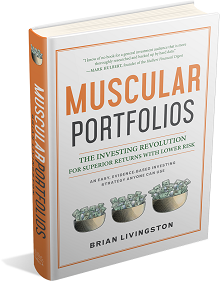 BRIAN LIVINGSTON is a successful dot-com entrepreneur, a col­um­nist for Market­Watch and Stock­Charts, and author of Muscular Portfolios (2018, BenBella Books). He is also the author or co-author of 11 books in the Windows Secrets series (1991–2007, John Wiley & Sons), with over 2.5 million copies sold. From 1986 to 1991, he worked in New York City as assistant IT manager of UBS Securities; a consultant for Morgan Guaranty Trust (now JPMorgan Chase); and technology adviser for Lazard Ltd. He was the weekly Windows columnist for InfoWorld magazine from 1991 to 2003. During portions of that period, he was also a contributing editor of CNET, PC World, eWeek, PC/Computing, Datamation, and Windows magazine. In 2003, he founded the Windows Secrets Newsletter, which grew from zero to 400,000 email subscribers. He served as its editorial director until he sold the Windows­­Secrets­.com web­site in 2010. He is currently president of the Seattle regional chapter of the Ameri­can Asso­cia­tion of Indi­vidual Inves­tors (AAII).